Our Generation “What a Trek” – What’s in the Box? I have a love-hate relationship with the Our Generation company. 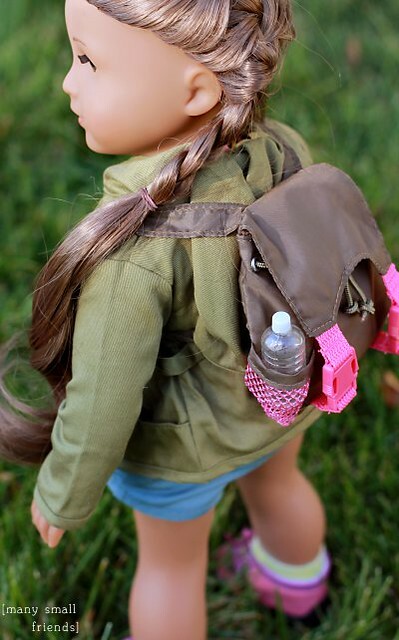 In case you’re not familiar with the brand, Our Generation makes dolls, clothing, and accessories that are compatible with many other 18″ doll lines like American Girl. Our Generation is primarily distributed by Target, but you can find some of the items on Amazon and through resellers on eBay. 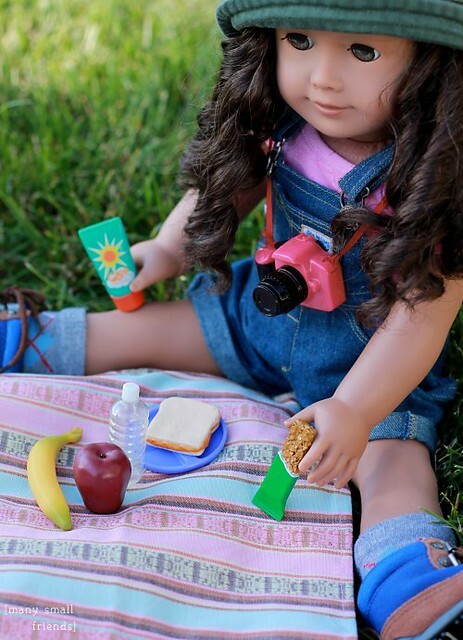 I love Our Generation because they make cute, playable doll food and accessories that work fantastically for American Girl and our other 18 inch girls. 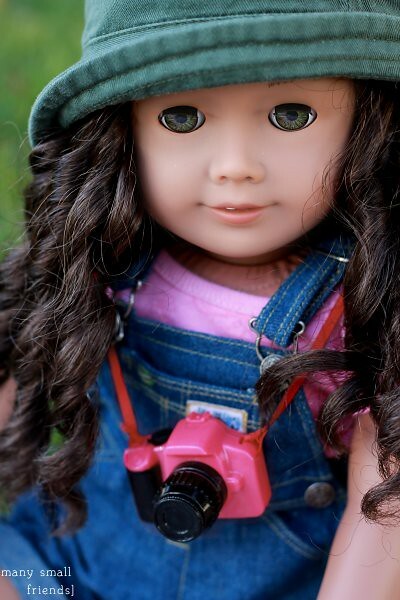 I don’t buy the OG dolls ( American Girl has made me into a doll hair snob and OG wigs can’t yet compete) but I’m always on the lookout for the new OG accessory sets. They aren’t the quality level of AG, but they’re usually a third of the price and well worth the money spent. I would probably buy the clothing as well, but I talk myself out of purchases because, “I could sew that”. Sound familiar, fellow seamstresses? What I hate about Our Generation is a major distribution problem. I’m not sure if the issue stems from Target or OG, but the availability of the accessory sets I’m pining for are spotty, at best! It’s completely unpredictable when and where the items will be available. Some sets sell out immediately, never to return, and then others languish for months on end. My best advice for Our Generation items is, “If you see it and love it, buy it, because it may never be restocked.” I learned this painful lesson with an OG sewing set two years ago. I had the package in my sweaty little hands, but put it back because I was feeling frugal that day, and have yet to find it again. Occasionally the set pops up on eBay and usually sells for over $100. The price the day I held it in Target? $16. Arghh! And it’s not just my bad luck, this story is repeated amongst my doll collector friends. I can’t understand a company that leaves that kind of cash on the table. Here I am, begging you to take my money, and you can’t reliably get your most popular items on the shelves? Insanity, I tell you. Anyway, end rant. I happened upon the Our Generation “What a Trek” set at my local Target last week and knew it had to be mine. I like a lot of the pieces, but it was the dolly camera that sold the set. I’m not a superfan of the unrealistic fuchsia color, but I suppose if it bugs me enough I can repaint it. 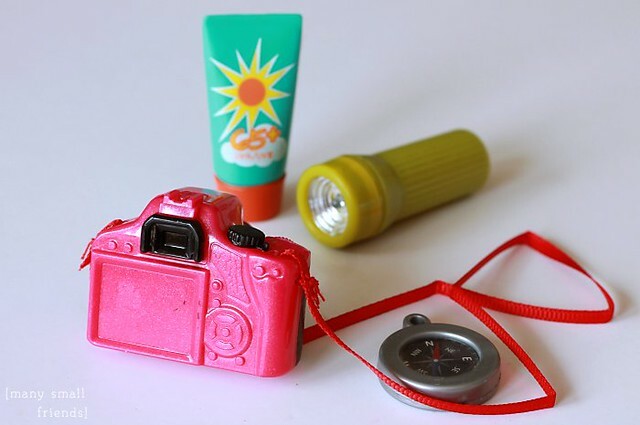 In addition to the camera, the set includes a good assortment of doll food, a few dishes, and some typical camping and hiking gear including sunscreen, bug spray, a compass, a flashlight, bandages (which have a removable strip that reveals a sticky backing) and a lightweight nylon backpack to carry it all. All of the accessories are plastic, of course. One nice surprise is that the lens barrel on the camera can turn as if to be “focused”. So cute! There are some obvious and somewhat large molding marks on the apple and banana. 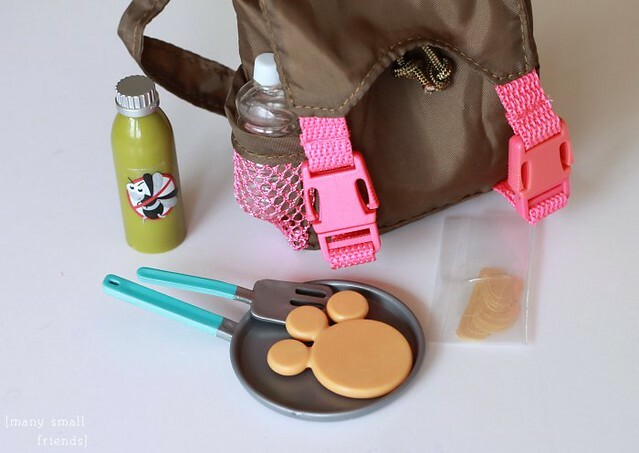 The apple, banana, granola bar, peanut butter sandwich, and bear-paw-shaped pancake are made of a flexible vinyl rather then rigid plastic. 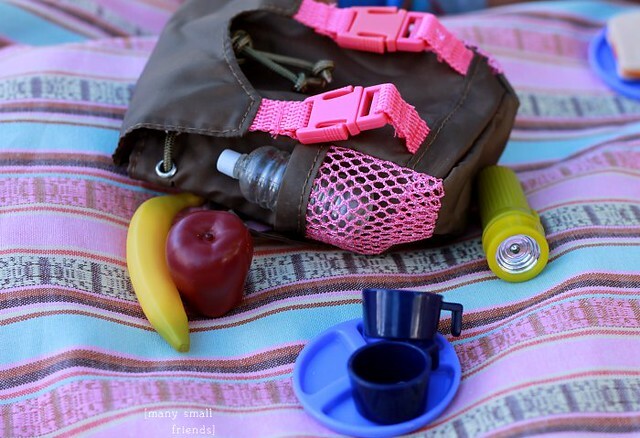 The tops of the water bottle, bug spray, and sunscreen are fixed and not removable. The flashlight doesn’t have a real bulb or lighting mechanism, but the shiny silver center reflects light and it almost looks like it’s actually working. The face of the compass is just a fixed sticker under a plastic cover. My daughter and I took the girls outside to give everything a test run. Taryn (My American Girl #44) and Kanani were our happy volunteers. They both consider themselves to be the most outdoorsy of the small friends and neither are prone to mosquito bites. Of course they applied sunscreen (a responsible SPF 65+) and sprayed on some bug spray, just in case. We made a short 5 minute unboxing video, if you like that sort of thing. I would like to close this post with an open letter to Our Generation. I have good news for you! I have some money I would like to give you and, better news yet, I have lots of friends with money they would also like to give you. This seems simple enough, because I’m sure you would like to receive our money. Receiving money is actually a key point in your business model, correct? I ask, because “teasing Stephanie with adorable sets like the new Bon Voyage Travel Set but making them neigh impossible to find” appears to be the more plausible model. While I’m asking you to do me favors like taking-my-money, would you mind removing the Sewing and Dressmaking Set from your website altogether? It hasn’t been available for purchase for several years and the tease, at this point, has become just plain cruel. Speaking of the Sewing and Dressmaking Set, are you aware that your competitor is selling a similar product for $275? Do you know how many $16 sewing sets you could blow out the door this year? Are you certifiably insane not to have these sets on the shelves in 2014? But I digress. Back to taking my money. To make this monetary exchange possible, I am pleading with you to do a better job distributing your products. Target is good! Amazon is good too! Heck, I’ve even been known to pay a little more to the resellers on eBay. But I’m not paying 10x retail. I just can’t pull that trigger. So pretty please, get your stuff on shelves. I’ll buy it! My friends will too! A devoted but frustrated dolly consumer. 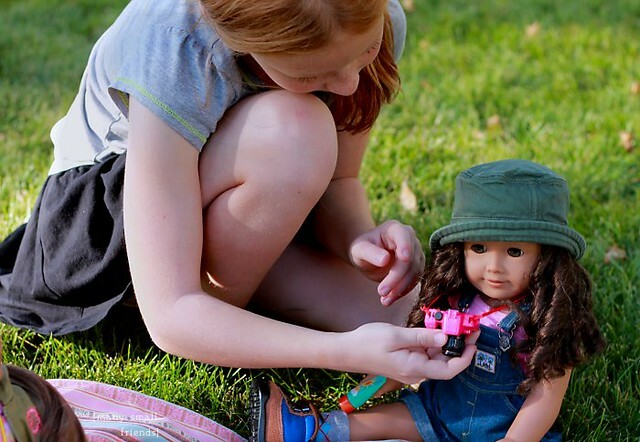 This entry was posted in Doll Review, Doll Video, Fun Doll Finds and tagged 18" Dolls, Doll Review, Doll Video, Our Generation. 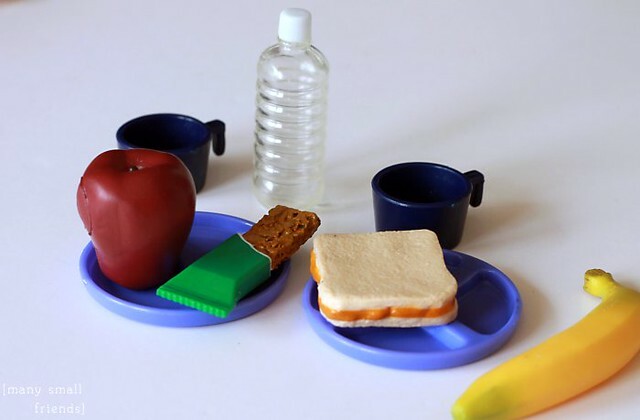 Cute set! And I will agree with you 150% on Target dropping the ball in their marketing of this line. I wrote them an email and got a very poor response, I wrote several blog posts which I directed to them via Twitter and got some poor excuse, I don’t think they care. There are several sets that I would buy in a heart beat if I could find them (including the sewing set you mentioned), but I’ve given up, with gas at over $3 a gallon and my knee pain, it just isn’t worth it anymore. Hello Target, are you listening??? I just ran across a Facebook post from a woman with a similar complaint over trying to find a specific OG doll that her daughter wanted. It’s too bad because their stuff is cute and very reasonably priced. It’s not doing much for my opinion of Target. I guess I’ll take my business elsewhere. Sing it, Sister! I’m curious whether the issue is with Target corp or Battat/Our Generation. I haven’t regularly “stalked” Target for other non-toy items and I don’t know that I fully understand the relationship between Target and OG. Anyway.. it’s annoying! The problem is with Target. They are the only true distributor for OG. Anything you find on Amazon is stuff purchased at Target and resold. You can’t rely on the online inventory because they have the worlds worst system where multiple items can have the same item number. I honestly wonder how they stay in business if this is typical. OH my gosh, Flo.. Target’s online INVENTORY system! That’s a whole ‘nother complaint letter for me to write! It drives me absolutely batty and it’s totally unreliable across all the departments I care about (ahem. toys. lol). Great pictures! I think I’ll pick up this set if I’m lucky enough to find it. We have at least 4 Targets within easy driving distance, and I still have trouble finding things. (Last year I really wanted that little lunch box set!) I think you should send your letter to OG! Ahh!! I never found that lunchbox either. I bet if I sent that letter OG would never send anything to my local Target ever again to spite me. ha ha! That looks like a really great set! I think I’ll keep an eye out for it for my niece…unfortunately I have the same experience with these as you. The Target near me usually has three things in the midst of an empty section of shelving where things are clearly intended to be. It’s very odd! Still pining for the owl lunch box and kicking myself for not getting it. The sewing set is on a LOT of our lists. The other issue I have with Target and OG is the very clear marketing to ethnic populations. 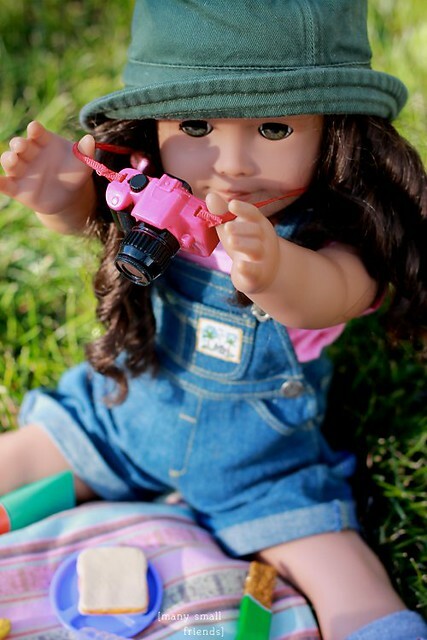 If you don’t know what I mean, go to your store and see what color your dolls are. Is there a diversity or are they mostly one color? I had to drive south to get a black doll. Not nice. Yes, sadly there isn’t much diversity at our local stores either. The treadle sewing machine sold by The Queen’s Treasures is very nice. Super expensive, so it’s worth it to wait for a sale and/or sign up for an account on her website so you can get special pricing. I’m glad I’m not alone in my pain?? lol I’m sorry we’re both foolish?? 😉 Good to know about QT’s version. I think I’m just as in love with the little scissors and doodads as the machine. Surely AG or OG or some company will produce an entire set like that again? You are so right, Joannah! That is part of the reason I couldn’t get into Asian ball jointed dolls. I am waaaaay too impatient for the process of ordering from overseas. I have purchased a few dolls through Amazon UK, however, and had no problems.